Shop online for 26 sundance model trains at discounts up to 16%. This is the Santa Fe (Warbonnet Nose/Cigar Band, Yellow, Red, Black) 2-3/4'' Cloth Railroad Patch by Sundance Marketing. 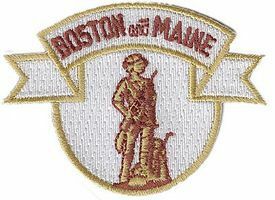 This is the Boston & Maine (Minuteman, White, Maroon, Yellow) 2-1/2'' Cloth Railroad Patch by Sundance Marketing. 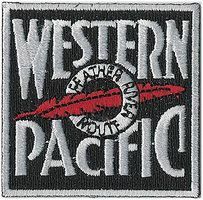 This is the Western Pacific (Featuer River Route, Black, White, Red) 2'' Cloth Railroad Patch by Sundance Marketing. This is the Penn Central (Worms, Black, White) 2-3/8'' Horizontal Cloth Railroad Patch by Sundance Marketing. 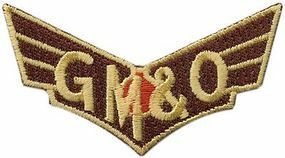 This is the Gulf, Mobile & Ohio (Wings, Maroon, Red) 2-5/8'' Horizontal Cloth Railroad Patch by Sundance Marketing. 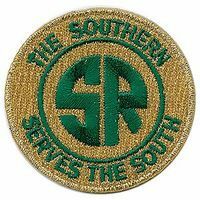 This is the Southern Railway (Serves the South, Yellow, Green) 2'' Diameter Cloth Railroad Patch by Sundance Marketing. 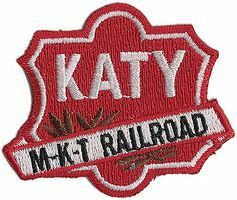 This is the Missouri-Kansas-Texas (Katy Shield, Red, White) 2-1/4'' Horizontal Cloth Railroad Patch by Sundance Marketing. 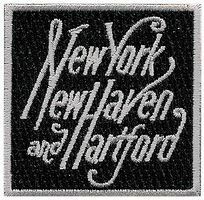 This is the New York,New Haven and Hartford (Script, White, Black) 2'' Cloth Railroad Patch by Sundance Marketing. This is the Chesapeake & Ohio (Chessie Kitten in Heart, White, Black) 2'' Cloth Railroad Patch by Sundance Marketing. This is the Cotton Belt/SSW (Black, White) 2'' Horizontal Cloth Railroad Patch by Sundance Marketing. This is the Norfolk Southern (Diesel Nose Thoroughbred, Black, White) 2-5/8'' Cloth Railroad Patch by Sundance Marketing. This is the East Broad Top (Black, Silver) 2'' Vertical Cloth Railroad Patch by Sundance Marketing. This is the Richmond, Fredericksburg & Potomac (Blue, Gray, Yellow) 2'' Cloth Railroad Patch by Sundance Marketing. This is the New York, Susquehanna & Western (S Logo, Yellow, Black) 1-3/4'' Cloth Railroad Patch by Sundance Marketing. This is the Norfolk Southern (Stripes, Black, White) 2-5/8 Horizontal Cloth Railroad Patch by Sundance Marketing. This is the New York Central (System, Red, White) 2-3/8'' Horizontal Cloth Railroad Patch by Sundance Marketing. This is the Bangor & Aroostook (Shield, Yellow, Blue) 2-3/8'' Vertical Cloth Railroad Patch by Sundance Marketing. This is the Western Maryland (Fireball, Black, Gold, Red) 3'' Horizontal Cloth Railroad Patch by Sundance Marketing. This is the Reading (Diamond, Black, Yellow) 3'' Horizontal Cloth Railroad Patch by Sundance Marketing. This is the Lehigh Valley (Diamond/Flag, Black, Gray, Yellow) 3'' Cloth Railroad Patch by Sundance Marketing.